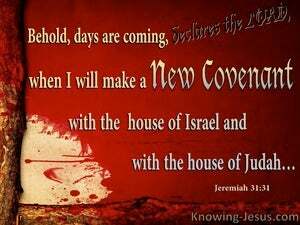 "Look, the days are coming"-[this is] the Lord's declaration-"when I will make a new covenant with the house of Israel and with the house of Judah. "Look, days are coming," declares the LORD, "when I'll make a new covenant with the house of Israel and the house of Judah. 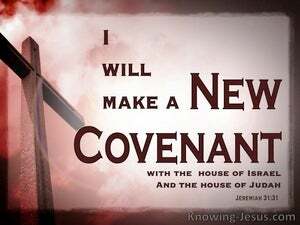 "Indeed, a time is coming," says the Lord, "when I will make a new covenant with the people of Israel and Judah. 30 "But everyone will die for his own iniquity; each man who eats the sour grapes, his teeth will be set on edge. 31 "Behold, days are coming," declares the LORD, "when I will make a new covenant with the house of Israel and with the house of Judah, 32 not like the covenant which I made with their fathers in the day I took them by the hand to bring them out of the land of Egypt, My covenant which they broke, although I was a husband to them," declares the LORD. 'For behold, days are coming,' declares the LORD, 'when I will restore the fortunes of My people Israel and Judah ' The LORD says, 'I will also bring them back to the land that I gave to their forefathers and they shall possess it.'" "Behold, days are coming," declares the LORD, "when I will sow the house of Israel and the house of Judah with the seed of man and with the seed of beast. 'Behold, days are coming,' declares the LORD, 'when I will fulfill the good word which I have spoken concerning the house of Israel and the house of Judah.